It does not Happen to often in all the reviews I have done that it is hard to find some cons of a grill. This Char Broil tru infrared the big easy oil-less turkey fryer however this is one of them. What I like in particular is the fact that this turkey fryer is so much safer than the ones we used and contained oil. This by itself is already a reason to change to oil less and infrared. The meat that is cooked in this char broil infrared oil-less fryer seems to come out perfect every time. Most positive what I read is that the meat stays moist and the skin is crispy. I think I can give this char broil infrared oil less turkey fryer a positive recommendation. The team of Better Grills. Grill surface of the Char broil infrared turkey fryer. This grill is 24.5″ high and 22.1″ in diameter. Large enough for 2 chicken. This big esy turkey fryer is built from stainless steel. The infra red turkey fryer comes with every thing you need except the propane gas tank. The cooker includes a cooking basket with lifter. The meat thermometer, read more about that in our summary. A cooking guide and the cool touch handles. The rotary ignition, and the grease pan. No hot oil to burn, splatter or spill. No expensive oil to purchase, clean-up or recycle. Saves about $60 in oil that you can use only twice. Cooks in about 8 minutes per pound. Use a dry rub because it does not get washed of in the oil. No time to wait for oil to cool of after using it. Found a few minor cons for this big easy turkey fryer. Construction is a little “cheap” the welds are not top quality. Cooking takes longer than in an oil fryer. Oil fryer might last longer because it is build heavier. The thermometer is not real accurate. I can not find to many bad things about the char broil oil less turkey fryer model number: 14101480. 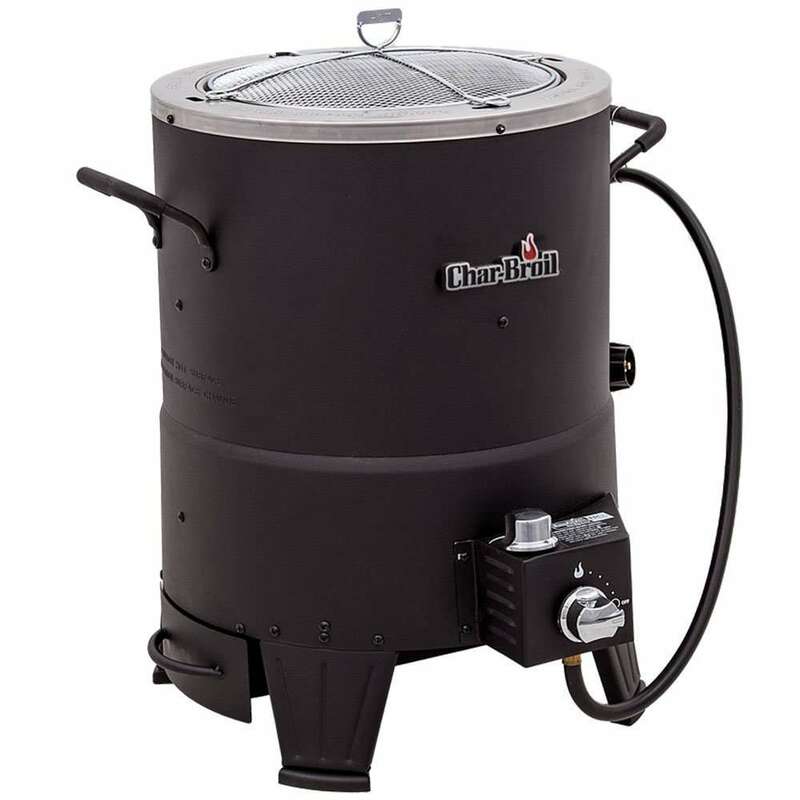 I read people searching for a Coleman oil less turkey fryer but I could not find one so I guess this Char Broil is what they are actually looking for. The only few things I could find was the quality of the fryer. Some people mentioned the poor quality of the welds and that it fell apart after a year. I think just like any other grill it might have to do with maintenance and storage, because most people do not mention anything about that. Like always you can have a faulty product and that is why it is important to start using it as fast as you can and find out the problems within the warranty period of 3 months. All the meat that I have read about comes out great and moist. This infrared turkey fryer can be used for all kinds of larger curt meats. I have read and seen recopies with chicken, beef, ribs, ham, turkey and many other cuts of meat. Like with any grill we recommend to use a quality digital thermometer because most ones that come with grills are not to good and the one that comes with this turkey fryer seems to be no exception and I found out that it can be off a lot. The time to cook a turkey seems to be a little longer, but if you add the time it takes to heat up the oil in a turkey fryer that uses oil, the total time with the oil less infrared is shorter. We always recommend a quality grill cover. This will protect your grill not just from bad weather, but also from getting dirty or damaged. This will probably also have an effect on how long you can use this turkey fryer. 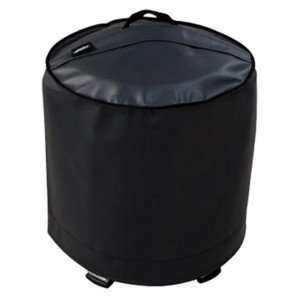 Click on the image on the left to see the price of this recommended grill cover for your turkey fryer. Here are some tips we found to improve the use of the charbroil oil less turkey fryer. Oil the basket after each use. You can use fine woodchips for a smoke flavor. Open the propane tank first, then the big easy valve and then light it. Put any poultry in it with the legs up. Use a quality thermometer like on any other grill. One problem that propane grills have is that the regulator safety stops it from getting the flame high. If you have this problem you can have a look here at how to fix problems with gas-regulators. This is how this thing works. 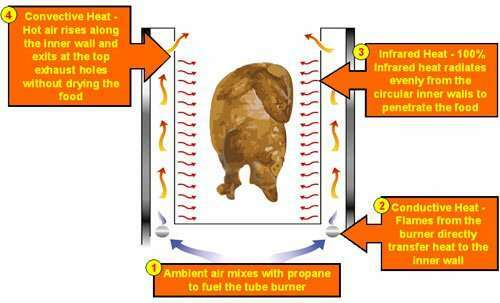 Have a look at the picture to see how this infrared oil less turkey fryer works or watch the video. Video review of the Char-Broil Big Easy Oil-Less Turkey Deep Fryer from YouTube. Here is a video of the old way of deep frying a turkey and what can and has gone wrong so many times. If there are so many warnings about using a deep-fryer to cook a turkey why even using one and take a change while there is a great alternative like the big easy oil less turkey fryer. But here are some warning tips from the fire department for if you do use one with oil. Seen enough and would like to see how cheap these safe oil less turkey fryers are. click on the button to find out what we recommend. Check out more reviews of the char broil big easy infrared oil less turkey fryers Click on the link !! Read all our Char Broil infrared grill reviews you can go to the menu or our search option.